My favorite parts of New York are rough around the edges. So it should come as no wonder that I love Sunset Park. While its name would indicate pastel views of a fading day, that’s only half true. In just about the center of this Brooklyn neighborhood bounded by the East River and 9th Avenue, 36th and 65th Streets, sits a lovely little park atop one of the highest points of New York as a whole, from which you can indeed enjoy a lovely sunset. But venture downhill on either side and the landscape gets a bit less manicured and a lot more interesting. See, from the Industrial Age to World War II Sunset Park was an important shipping and industrial center. The Brooklyn Navy Yards and Industry City, an enormous light manufacturing complex on the water, provided thousands of jobs. These as well as the warehouses and smaller factories surrounding them made the neighborhood a humming production center. We need not go into a history of the deindustrialization of cities in the post-World War II Era (though it’s an interesting topic), but suffice it to say, once the war was over, industrial jobs moved out of the city to the suburbs, then south, then further south still, leaving behind the jobless and vast tracks of unbeaten concrete. Pretty soon, the plants started breaking through. While life has somewhat returned to Industry City and the Brooklyn Navy Yards in the form of artisan ice cream parlors and maker studios, the plants remain to a large degree. Take for instance these Japanese Knotweeds breaking through what was once a seed and supply store. Or this Tree of Heaven clearly ignoring this no parking sign. Not to mention this magical City Plants garden outside of Danny’s Tire Repair. 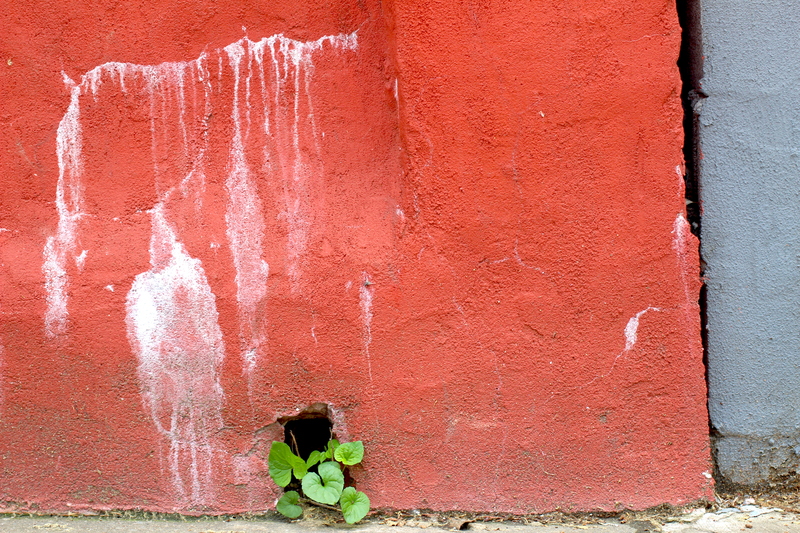 Near the East River I came across this Dandelion breaking through the bricks. And on 54th Street between 3rd and 4th Avenues I spotted this Mugwort creeping through a corrugated iron wall. I then I just went a little crazy. Truth be told, I’m a little obsessed with these plants. They are remnants of what has been and no longer is as well as what might be. To this last point, urban flora is remarkably adaptable to even the harshest conditions. It thrives in extreme heat, can tolerate exceptionally toxic soil, and endure intense storm runoff. In affect, they are field tested for a warming world with increasingly volatile weather patterns. Resilient as hell and tenacious as anything, they’re also pretty inspiring. So forget the roses. Stop and enjoy the City Plants.